Road Trip Wednesday is a “Blog Carnival,” where YA Highway’s contributors post a weekly writing- or reading-related question and answer it on our own blogs. You can hop from destination to destination and get everybody’s unique take on the topic. We’d love for you to participate! Just answer the prompt on your own blog and leave a link in the comments – or, if you prefer, you can include your answer in the comments. This week’s topic is: If you could rewrite the ending of any book, how would you rewrite it and why? 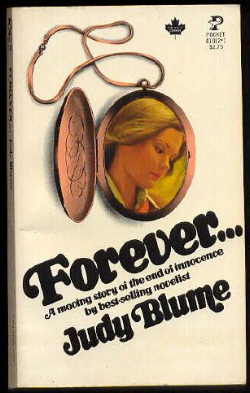 Don’t get me wrong, I absolutely LOVED Forever… and frankly, I want to BE Judy Blume, but the ending of her 1975 novel left me feeling sad and a little hopeless. In case you’ve never read it, Forever… is the story of Michael and Katherine, high school seniors who fall convincingly in love, sleep together, and promise each other forever. In Judy Blume’s ending (((SPOILER ALERT!))) Michael and Katherine break up after a summer of separation. Had I written it, I would have let Michael and Katherine live on in literary teenage bliss Forever… because I’m a hopeless romantic who believes high school love can survive young adulthood and beyond, if it’s honest and genuine. Naïve? Maybe. Optimistic? Definitely! But, if I’m being truthful, Judy Blume’s original ending is so much more realistic, courageous, and thoughtful that mine would have been. Let’s face it. Teenage relationships break up. Often. And Ms. Blume nailed that beautifully, which is why, I suppose, her books so amazingly timeless. Thanks, YA Highway, for your awesome Road Trip Wednesday topic. I look forward to participating again next week! ACK! I’m so with you. While I know the whole point of that book was realism, the ending made me really angry/upset/frustrated. If wanting a happy ending (or at least a hopeful one, sheesh) makes us naive, then so be it. I haven’t read that one so I scrolled past the post, but glad you joined us for RTW! I love Judy Blume, but I have to say I was disappointed with Forever overall. I think I might be too cynical for it. With that said, I was still bummed at the end but I agree with Heather.